Normal 0 false false false false EN-CA JA X-NONE. Summer is winding down, but there are still a few months of good weather to enjoy before winter sets in — and what better way to enjoy them than behind the wheel of a brand new Mazda Miata? In the three decades since the Miata first appeared in 1989, it has established itself as one of the most popular sports cars of all time. Earning rave reviews from happy customers and industry experts alike, the Miata almost single-handedly revived interest in the classic British roadsters of the 1960s, and set new benchmarks for what a sports car can do. There might be faster vehicles on the road, just as there might be sports cars with more iconic names, but the Miata is about one thing: fun, intuitive driving. And those who have had experience behind the wheel can vouch for its success in delivering it. If you want to see for yourself why so many car fans are in love with the Miata, visit your Toronto Mazdadealer this summer and see for yourself how Mazda’s engineers have created a driving experience that blends fashion, performance, and playful attitude at a price point that puts it within reach of just about anyone. Generations of drivers have fallen in love with the easy handling and incredible spirit of this modern roadster, making it one of the most popular Mazda cars on the road, especially in Canada, where its optional soft or retractable hard top makes it an ideal sports car for drivers who want a vehicle that can handle the chilly winter weather. In addition to being able to choose two different roof styles, interested shoppers can also consider three different trim options, GS, GS-T, and GT for added features. Even with the most basic package, the Miata still delivers the best Mazda engineering and cutting-edge electronic features like Advanced Blind Spot Monitoring and keyless start. Reviews for the 2019 models have already started coming in, and they are unanimous in their admiration for Mazda’s ability to pack so many great new features into such a compact and driveable package. Picking up your very own Miata this summer might be easier than you might think. At Yorkdale Dufferin there are many Mazda finance options specifically designed to help you get purchase a new Mazda vehicle on a payment plan that works for your budget. The Miata is already one of the most affordable vehicles of its kind on the market, and with the help of our finance experts, getting behind the wheel of your very own Miata is easy. With our online finance application form, you can get started on the process before ever setting foot in our showroom. Whether you have a garage full of sports cars or are considering purchasing your very first, the Miata has a lot to offer. 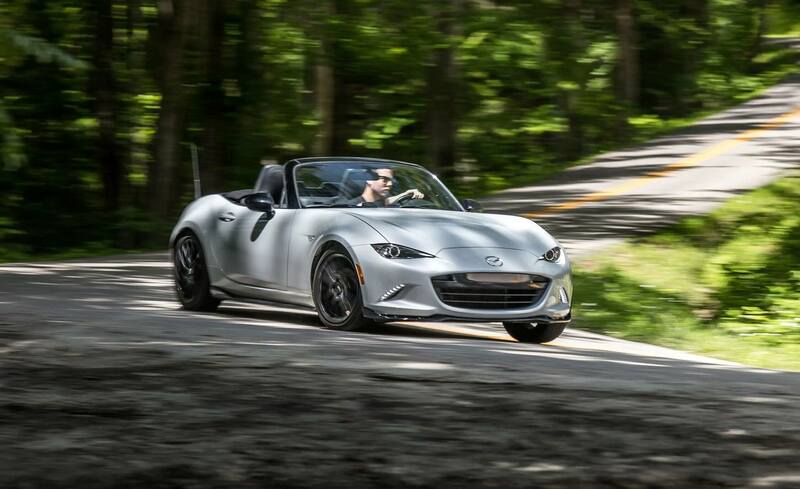 With its fun handling, great feature options, and eye-catching style, it is no wonder happy customers have called the Miata the best sports car of all time. If you are looking for a great car to enjoy the final months of summer in, why not book a test drive at Yorkdale Dufferin Mazda and find out for yourself just how much fun the Miata can be? You won’t be disappointed!